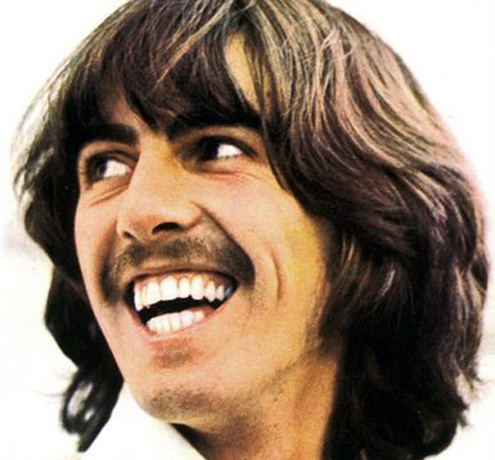 Posthumous Concert Goer: Harrison as he appeared on the cover of the Let It Be album. No, I haven't gone crazy. I do know that George is no longer with us and hasn't been for the past 15 years. But this story from KQED's Adrienne Blaine shows that the Beatles' lead guitarist is still with us in spirit.....and Smartphone. Adrienne was recently at a concert where she saw two men hold aloft the above image on their smartphones. She spoke to a friend, Ernie Houk, who said he had witnessed the same thing at a Tame Impala concert he attended and, thinking it was just another dumb thing someone did to get attention, shrugged it off until he seen around 20 other concert-goers doing the same thing. Curiosity aroused, Adrienne tracked down the initiator of the George picture, a teenager called Russell Cowick. Turns out Russell does this as a test to the audience, as in some of his classes at San Francisco university, there wasn't anyone who knew the name of any of the Beatles. While this may be disturbing to many, Cowick decided to see how many of his fellow concert-goers knew who George Harrison was. Luckily, many did. Just by holding up the image of Harrison from Let It Be, fellow concert goers could quickly respond by finding the image and holding it up.The social experiment counted on the fact that they could name George Harrison and so find his image. If they didn't know it, they would just see the picture and it wouldn't register. Cowick plans to do this until he can't go to concerts anymore and then tell his kids to do the same. "I hope that When I'm 64, there'll still be a couple of people left who'll shoot me a George back" he says. For his part, Ernie Houk said he'd do it. "if it meant that a kid who had no idea who the Beatles were, decided to listen to them for the first time" he said. We agree wholeheartedly with you there, Ernie. Will YOU be doing this at concerts in the future? Perhaps with Ringo, John or Paul's image? Just to see who will do the same?